Synopsis: Left heartbroken by the woman he loved and lost many years ago, Manglehorn, an eccentric small-town locksmith, tries to start his life over again with the help of a new friend. Although director David Gordon Green cut his teeth making action-comedies like Pineapple Express and The Sitter, he proved last year that he could do drama as well with the awesome Nicolas Cage vehicle Joe. Now, he does the same thing with Al Pacino (Danny Collins) in Manglehorn. Manglehorn stars Pacino as A.J. Manglehorn, an aging locksmith who spends all of his time pining over a woman named Clara whom he lost years before. He has a dysfunctional relationship with his son Jacob (Chris Messina from Devil) and gets only sporadic visits with his granddaughter, Kylie (the adorable Skylar Gasper), so his best friend in the world is his cat, Fanny. At least, until a lonely bank teller named Dawn (The Piano‘s Holly Hunter) takes a liking to him and tries to break him out of his shell. The entire time, Manglehorn just sits and writes phantom letters to his long lost Clara each and every day. To say Manglehorn is a character piece is an understatement. Written by first-time screenwriter Paul Logan, the film really is just a series of events in the life of the main character – lunch with his son, a play date with his granddaughter, a trip to the bank. There is a bit of a story arc, but it’s mostly character development stuff. There are several memorable individual scenes in the film, but they’re just that: individual scenes. They don’t quite fit into any bigger story. For example, in one particularly surreal sequence, Manglehorn is walking Fanny to the vet and he stumbles upon a car accident. He walks past it, his kitty in his arms, as if the crash is not even there. The scene is shot in slow motion, and the sounds of the ambulance sirens and crying people are muffled and lost in the soundtrack, with Manglehorn only hearing the purring of his cat as he waltzes through the carnage. It’s one of the most haunting scenes in recent memory, but it has nothing to do with any bigger picture; it only serves to illustrate the isolation and detachment of Manglehorn’s character. Manglehorn may lack action and plot, but it’s got plenty of style and heart, and that seems to be the point. There’s this title character who, usually shut away from the world, is forced to interact with it, and the audience both empathizes and sympathizes with him. Sometimes, it seems as if the entire movie may all just be a dream in the old man’s mind. Where else could he witness a middle-aged husband walk into a bank and start singing, only to have the wife come out from the back and finish the duet with him? Or have an attractive younger woman, while on a dinner date, offer to take a bath with him? Manglehorn also seems dreamy in the way it is shot, with cinematographer Tim Orr (who has shot just about all of David Gordon Green’s movies) keeping the imagery interesting even when the movie is not, choosing to focus on seemingly random crazy objects and characters like mimes, beehives, or popcorn machines. For a movie where not much happens, Manglehorn is pretty entertaining. 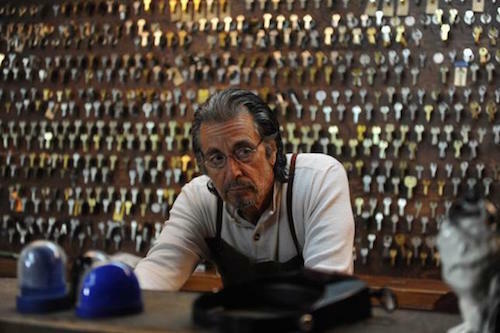 It looks like Al Pacino and David Gordon Green make a good team. They’ve managed to turn a simple character study like Manglehorn into an intriguing and captivating movie. And that’s no small feat. Like any good character-based movie, Manglehorn relies heavily on the performance of its cast, and in this case, the cast means Al Pacino. Luckily for the film, Pacino is more than up for the task. At times, it seems like he’s just Al Pacino being Al Pacino, but that’s just indicative of how much the actor connects with the character, which in turn causes the audience to connect with him as well. Pacino not only carries the movie on his shoulders, but he elevates the rest of the cast, who are all really just bit players in Manglehorn’s world. Whether it’s Chris Messina as his son or Holly Hunter as his pseudo-love interest, Pacino’s chemistry is infectious, and the other actors both feed off of him and bounce it back to him. Even filmmaker Harmony Korine (Spring Breakers), who has a small part as a kid who played little league for Manglehorn years before, gets in on the action and benefits from Pacino’s experience. But, in the end, Manglehorn is Al Pacino’s movie, and he absolutely owns it.